Plants annual, cespitose, 15-50(-70) cm, glabrous, base soft; rhizomes absent. Leaves distichous, in fans, to ca. 2/3 plant height; sheaths keeled, equitant, margins entire; ligule absent; blades bifacial (flattened in same plane as sheath), narrowly triangular linear, to 2 mm wide, margins scabrid at least distally. 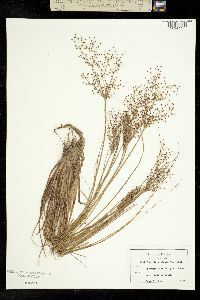 Inflorescences: anthela compound, usually diffuse, branched, broadening upward, often as broad as long; scapes slender, angularly ribbed and/or somewhat compressed distally, 1-1.5 mm wide or thick; involucral bracts exceeded by anthela. Spikelets dark red-brown, broadly ovoid to near round, 2-4 min; fertile scales broadly ovate to orbiculate, 1 mm, glabrous, apex broadly rounded, midrib not excurrent. Flowers: stamens 1-2; styles 3-fid, slender, base dilated, apex pubescent. Achenes pale brown, tumid, obovoid, 1 mm, apiculate, reticulate, with pits narrowly rectangular in 4-6 vertical rows per side, the longitudinal ribs most prominent and mostly warty. 2n = 10. Fruiting summer-fall, all year southward. Moist to wet sands and alluvia of open river and stream bottoms, low fields, drawdowns, shores, flatwoods, savanna, seeps, and open disturbed waste places; 0-200 m; introduced; Ala., Ark., Fla., Ga., Ky., La., Miss., Mo., N.C., S.C., Tenn., Tex. ; Mexico; Central America; South America; Asia; Africa; Indian Ocean Islands; Pacific Ocean Islands; Australia. 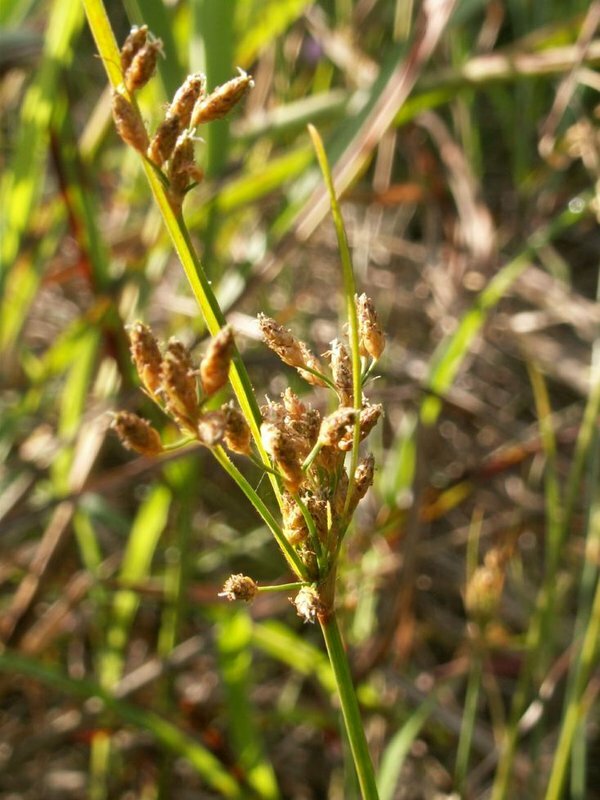 Fimbristylis miliacea is another widespread annual weed whose origin is probably in the Asian rice belt. Two Linnaean types bear the epithet 'miliacea.' 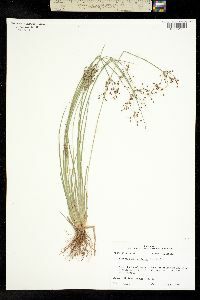 A good argument exists that Vahl, first to adopt the plant as a Fimbristylis, took the round-spikeleted element as F. miliacea; the other, ovoid, acute-spikeleted element thus became F. quinquangularis (Vahl) Kunth. Because Gaudichaud´s epithet 'littoralis' was not applied to the complex until 1826, it is invalidated in any case. Tufted annual to 5(-10) dm; lvs distichous and equitant, smooth, rigid; ligule wanting; longest invol bract shorter than the infl; spikelets 2-4 mm, stout, in a loose to congested system of cymes; scales ovate, usually blunt or emarginate; stamens 1 or 2; anthers less than 1 mm; style trifid, not much longer than the achene, ±fimbriate below the branches; achene 1 mm, obovoid, plump but scarcely trigonous, with several smooth or often warty vertical ribs connected by numerous fine raised ridges; 2n=10. Wet places, often a rice-field weed; pantropical, n. to Ky.